As part of the National Water-Quality Assessment Program, the U.S. Geological Survey collected and analyzed groundwater samples during 1996–2006 from the San Antonio segment of the Edwards aquifer of central Texas, a productive karst aquifer developed in Cretaceous-age carbonate rocks. 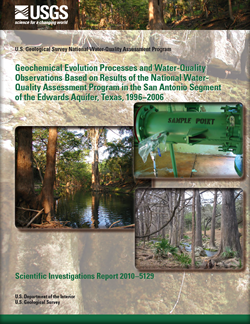 These National Water-Quality Assessment Program studies provide an extensive dataset of groundwater geochemistry and water quality, consisting of 249 groundwater samples collected from 136 sites (wells and springs), including (1) wells completed in the shallow, unconfined, and urbanized part of the aquifer in the vicinity of San Antonio (shallow/urban unconfined category), (2) wells completed in the unconfined (outcrop area) part of the regional aquifer (unconfined category), and (3) wells completed in and springs discharging from the confined part of the regional aquifer (confined category). This report evaluates these data to assess geochemical evolution processes, including local- and regional-scale processes controlling groundwater geochemistry, and to make water-quality observations pertaining to sources and distribution of natural constituents and anthropogenic contaminants, the relation between geochemistry and hydrologic conditions, and groundwater age tracers and travel time. Implications for monitoring water-quality trends in karst are also discussed. Geochemical and isotopic data are useful tracers of recharge, groundwater flow, fluid mixing, and water-rock interaction processes that affect water quality. Sources of dissolved constituents to Edwards aquifer groundwater include dissolution of and geochemical interaction with overlying soils and calcite and dolomite minerals that compose the aquifer. Geochemical tracers such as magnesium to calcium and strontium to calcium ratios and strontium isotope compositions are used to evaluate and constrain progressive fluid-evolution processes. Molar ratios of magnesium to calcium and strontium to calcium in groundwater typically increase along flow paths; results for samples of Edwards aquifer groundwater show an increase from shallow/urban unconfined, to unconfined, to confined groundwater categories. These differences are consistent with longer residence times and greater extents of water-rock interaction controlling fluid compositions as groundwater evolves from shallow unconfined groundwater to deeper confined groundwater. Results for stable isotopes of hydrogen and oxygen indicate specific geochemical processes affect some groundwater samples, including mixing with downdip saline water, mixing with recent recharge associated with tropical cyclonic storms, or mixing with recharge water than has undergone evaporation. The composition of surface water recharging the aquifer, as well as mixing with downdip water from the Trinity aquifer or the saline zone, also might affect water quality. A time-series record (1938−2006) of discharge at Comal Springs, one of the major aquifer discharge points, indicates an upward trend for nitrate and chloride concentrations, which likely reflects anthropogenic activities. A small number of organic contaminants were routinely or frequently detected in Edwards aquifer groundwater samples. These were the pesticides atrazine, its degradate deethylatrazine, and simazine; the drinking-water disinfection byproduct chloroform; and the solvent tetrachloroethene. Detection of these contaminants was most frequent in samples of the shallow/urban unconfined groundwater category and least frequent in samples of the unconfined groundwater category. Results indicate that the shallow/urban unconfined part of the aquifer is most affected by anthropogenic contaminants and the unconfined part of the aquifer is the least affected. The high frequency of detection for these anthropogenic contaminants aquifer-wide and in samples of deep, confined groundwater indicates that the entire aquifer is susceptible to water-quality changes as a result of anthropogenic activities. Like many karst aquifers, the Edwards aquifer responds rapidly to changes in hydrologic conditions, with accompanying changes in water-level altitudes, spring discharge rates, and water quality. Samples of groundwater were collected one or two times during the study period (1996–2006) from most sites, a sampling frequency which does not allow for evaluation of temporal trends. Five of the shallow/urban unconfined category wells had a higher frequency of sampling, with a total of eight samples collected from each well over the 10-year study period. These data indicate that changes in hydrologic conditions, as demonstrated by changes in rainfall, aquifer recharge, water-level altitudes in wells, and springflow at major aquifer discharge points, affect water quality. Variations in selected dissolved constituents or ratios of dissolved constituents (atrazine, nitrate, and magnesium to calcium molar ratios) at these five wells provide insight into the sources and transport of dissolved constituents and contaminants in the aquifer, and the relation between water quality and hydrologic conditions. These results suggest that atrazine enters the aquifer with surface-water recharge, whereas background nitrate concentrations in the aquifer are diluted by surface-water recharge. Higher nitrate concentrations and magnesium to calcium ratios occur in conjunction with lower water-level altitudes during drier hydrologic conditions. Geochemical age tracers, including tritium, chlorofluorocarbons, and sulfur hexafluoride, were measured in a majority of the groundwater samples. Results for apparent groundwater ages indicated that samples of groundwater from the Edwards aquifer are dominated by young (that is, water recharged within approximately the past 50 years) and (or) modern water (in this report, samples with apparent ages that belong to the present day, that is within 10 years of the time of sampling), with extensive groundwater mixing. These results are consistent with the regional hydrogeology and previous studies that document a large range of travel times and groundwater mixing. Apparent ages for all uncontaminated groundwater samples (many of the chlorofluorocarbon and sulfur hexafluoride results indicated that samples were contaminated by non-atmospheric sources of these tracers) ranged from 1 to 52 years, with a median of 20 years. These results are based on a piston-flow model, which might not adequately describe the range of ages in a mixed sample, which is a relevant consideration for karst aquifers such as the Edwards aquifer. In spite of uncertainties in age interpretation, age tracers provide insight into how changing hydrologic conditions affect groundwater recharge and mixing processes. Apparent age results for samples collected from the relatively shallow unconfined part of the aquifer were younger than those for samples collected from the deeper unconfined part of the aquifer. A comparison of apparent groundwater ages with calculated particle-track travel times from existing hydrogeologic models indicates that these flow models do not accurately represent the fast-flow (conduit-dominated) component of this karst aquifer. The model results, however, do show a progression toward longer travel times from the unconfined to the confined parts of the aquifer, which is consistent with geochemical interpretations and aquifer hydrogeology. The results of this evaluation of NAWQA data have implications for the design of monitoring programs in karst aquifers. When monitoring programs are intended to provide the data necessary to assess long-term trends and increase understanding of karst aquifer functioning, time scales of hydrologic and geochemical variability need to be carefully considered.